Cherry Marketing Institute. February is Great American Pies Month. To celebrate, try a new recipe. Find inspiration in our Pie & Pastry Glossary—ten pages of different types of pies and pie terms (and pictures of tempting pies). In fact, you may find a Valentine’s Day pie to bake for your loved ones. This cherry pie with a lattice crust (not hard to make—it just takes some extra time) sure says “I Love You.” Here are an easy classic cherry pie recipe plus a reduced-sugar cherry pie recipe. 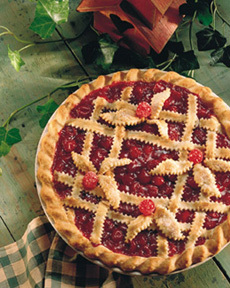 Find more pie recipes in our Gourmet Pies & Pastry Section. By the way, there are more than 1,000 varieties of cherry tree, but only about ten varieties are produced commercially. Each tree produces about 7,000 cherries or about thirty pies’ worth. The sour cherry or tart cherry makes the best cherry pie. See more fun cherry facts.